This mouse cell atlas is a resource for obtaining a deeper understanding of how specific DNA elements regulate cell type identity. An artist's conception of a mouse cell atlas, showing clustering of cells by DNA regulatory elements as step to identifying diverse cell types. The team applied a special assay that they had previously developed to profile a genomic feature called chromatin accessibility. The researchers were interested in how the DNA winding, wrapping and packaging into what is termed chromatin influences what genetic information is made available to be acted upon in each individual cell. The DNA is like beads on a string. Spaces form where the molecular “beads” are moved so that proteins can access and “read” the genetic information. That state is chromatin accessibility. In the study, almost a hundred thousand individual cells taken from 13 adult male mouse tissues were assayed. The tissues were: bone marrow, large intestine, heart, kidney, liver, lung, small intestine, spleen, testes, thymus, the whole brain and the cerebellum and prefrontal cortex of the brain. The scientists observed 85 distinct chromatin accessibility patterns, and could assign most of these to specific cell types. They also cataloged more than four hundred thousand potential regulatory elements. In general, the researchers were able to identify clusters of cells with similar chromatin landscapes, and then examine this cluster to pick out diverse cell types. They said that the quality of their data was variable, largely depending on tissue type. The data were of lowest quality in sperm progenitor cells in the testes, because DNA is packaged differently in these reproductive cells. The data gleaned in this atlas could advance the understanding of developmental pathways and the formation of cell lineages. For instance researchers can use this resource to understand how chromatin accessibility changes as immature blood-forming cells turn into mature blood cells with various roles. The methods and findings are published this week in the journal Cell. Please see the paper. The senior authors on the study were Cole Trapnell and Jay Shendure, both faculty in the Department of Genome Sciences at the University of Washington School of Medicine, and members of the Paul G. Allen Discovery Center for Cell Lineage Tracing and the Brotman Baty Institute for Precision Medicine in Seattle. Shendure is also a Howard Hughes Medical Institute investigator. Darren A. Cusanovich, a former postdoctoral fellow, and Andrew J. Hill, a graduate student, both working in Shendure’s lab, headed the study. Cusanovich and his colleagues developed the single-cell combinatorial indexing assay protocols critical to this research. “This single-cell technology measures how the genome is organized in individual cells and how genes are regulated, “ said Cusanovich, now an assistant professor at the University of Arizona. Other genetic studies, Hill noted, have shown that most genetic variants underlying common diseases fall into the non-coding regions of the genome, where the management of gene activity originates. “Research such as this is providing a view of how complex organisms can have such an incredible variety of cell types containing the same reference genome,” Hill said. Trapnell explained that most previous studies have applied genomic methods to tissues or samples composed of many cell types. Averaging across many different cell types, however, can obscure what’s going on in individual cell types. “We’re interested in genomic properties of cells at the single cell level,” he said. Also, he added, most research in this area has been on whether the expression of certain genes in cells are on or off, and less commonly on why or how the genes are activated, tuned or silenced. The researchers used their resulting data to identify what parts of the genome are “open” in different cell types and which genes these elements regulate. They then intersected this atlas with the results of human genome-wide association studies, which uncover genetic variants with possible disease links. The researchers were able to implicate the cell types that play a role in many common human disorders and traits in spite of the fact that the cell atlas data came from mice, not people. For example, the heritability for Alzheimer’s disease was not enriched in any class of the brain cells known as neurons, but instead was most strongly enriched in microglia, which defend the nervous system. In contrast, the strongest enrichments of heritability for bipolar disorder were in excitatory neurons. Other traits examined in this way included autoimmune conditions, high lipid levels, immunoglobulin deficiencies, body size and composition, asthma, hay fever, heart attacks, gout and a host of other conditions or characteristics. Related work led by UW Medicine researchers, also published this week in Molecular Cell, introduces Cicero, an algorithm named for the Roman orator. This algorithm can be used to determine the grammar of gene regulation. Here is the paper. The method taps into single-cell chromatin accessibility data and links regulatory elements in DNA to the genes they target. The software, written by Hannah Pilner, a graduate student in both the Trapnell and Shendure labs, determined how thousands of regulatory elements orchestrate gene expression in developing muscle cells. The scientists used Cicero for the mouse atlas to build a map of potential connections between regulatory elements in each cell type that was identified. The hope is that this sort of mapping will reveal how the millions of regulatory DNA sequences in the genome control how cells perform their specialize functions. The production of a human cell atlas is a daunting task, owing to the vast numbers of cells in the body, and the many different types of cells that are thought to exist over an individual’s life span. The average adult human contains approximately 37 trillion cells that vary in type, abundance and state of development. However, progress such as that described in these papers might aid in the creation of a human cell atlas. The researchers pointed out that what was once labor intensive to accomplish for a handful of cell types can now be done at single-cell resolution in just a few months. In contrast to a human, a house mouse is thought to have only about 10 billion cells in its body (approximately 0.02% as many as in the human body). Humans and mice diverged from a common ancestor about 75 million years ago. Despite the genetic changes that have occurred since then, the mouse provides many clues to human health and disease. Because of the evolutionary relationship, the mouse cell atlas will contribute to understanding how mammalian, including human, cell types arose. The Cicero project was funding by National Institutes of Health grants DK107979, DP2HD099158, DP1HG007811, R01HG006283, the Paul G. Allen Frontiers Group, the Alfred P. Sloan Foundation, the National Heart, Lung & Blood Institute grant T32HL007828, a National Institute of Health Genome Training Grant 5THG00035, and a National Science Foundation Graduate Research Fellowship, DGE-1256082. 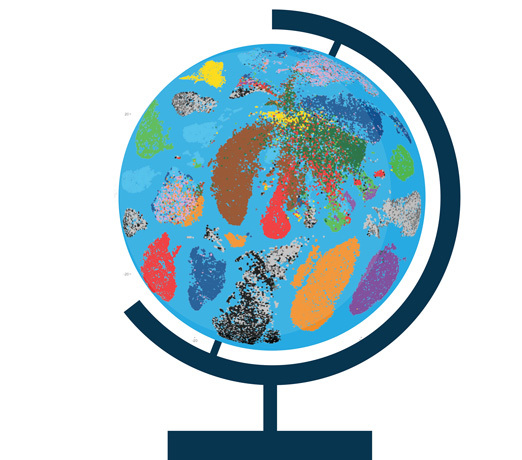 The mouse single cell atlas work was supported by the Paul G. Allen Frontiers Group, the W.M. Keck Foundation, the Alfred P. Sloan Foundation, and NIH grants DP1HG007811, R01HG006283, DP2HD099158, GM046883, and T32HL007828.